I have another wedding card to share today. I used an Inkadinkado stamp and MFT dies to make the card. 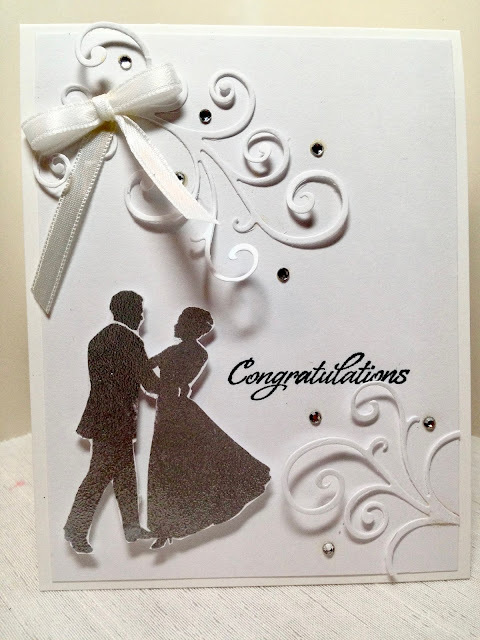 I stamped the bride and groom on a separate piece of card stock. I then sprinkled black embossing powder on it and heat embossed it. I cut the image out and popped it up on dimensionals. The sentiment is stamped directly onto the main image panel. I cut the swirls with an MFT die out of white card stock and only glued it in certain spots so it would swirl above the card stock a bit. 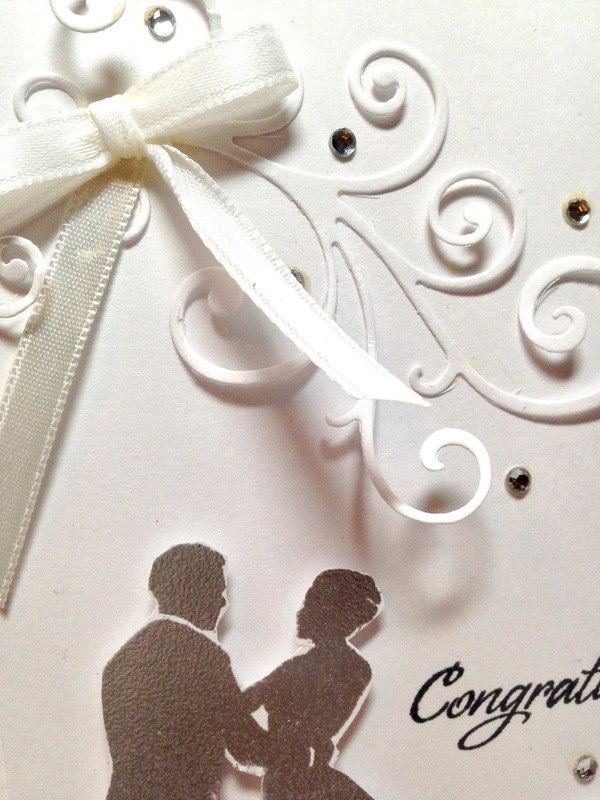 I glued a ribbon onto the card and also added some crystals. The bottom swirl is the same die, I just cut it to make it a little smaller. Beautiful 3D work, Amy, great job! Hugs, x. This is so beautiful! 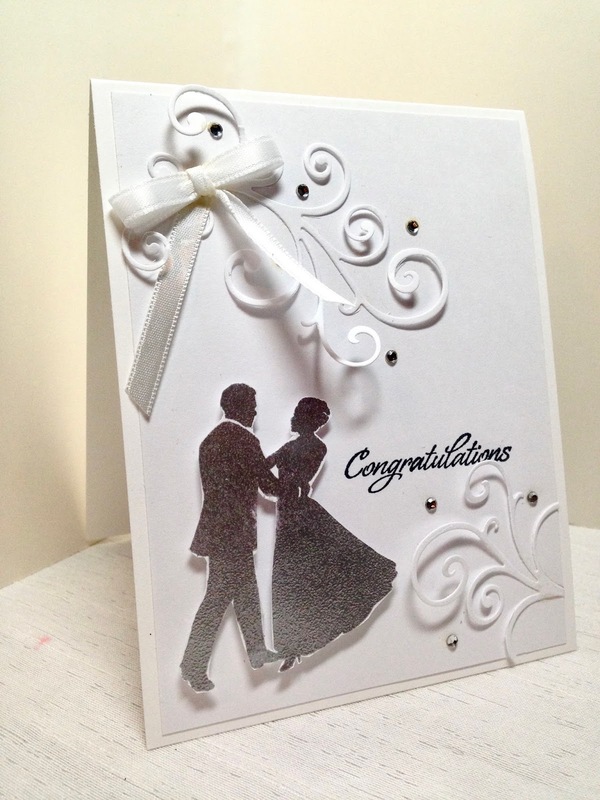 Gorgeous silhouette stamp and I love the diecut swirls! This is such a beautiful card Amy and certainly a keepsake. Thanks so much for linking up and sharing with us at #overthemoon link party. See you next week. Gorgeous! This would make such a delightful keepsake for the newlyweds! Thanks for sharing with Party in Your PJs! Wow! Such a beautiful card! It would be a real keepsake. Beautiful. My daughters could take this on...but I am so NOT a person that can do crafts. Truly gorgeous & elegant. Very pretty! Are you selling the cards or just showing how to make them? Thanks Marisa. Just showing how I made them. I used to sell them, but I don't have the energy for that anymore. Too much work for too little profit. 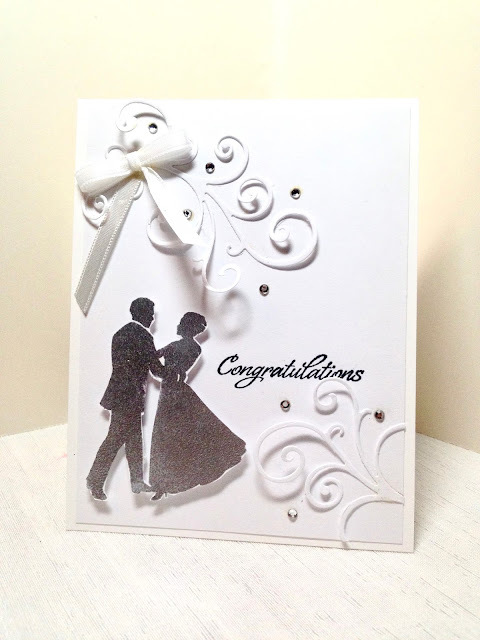 Very beautiful card and being handmade would make it very meaningful to the bride and groom!